finally finished a game i’ve been trying to finish for ages, namely paper mario for N64. i’d played its sequel years ago and it was actually one of the first gamecube games i’d played, and i hadn’t been that excited by it. i had actively disliked the wii sequel (although i had enjoyed the first mario & luigi game), but i was interested in seeing how the mario RPGs progressed from the original SNES title to the paper mario series. even though it’s been years since i’ve played the thousand-year door it was still somewhat surprising how much that game took wholesale from this game. not only are the mechanics pretty much identical, but even the supporting cast is pretty much functionally the same (and three characters, a goomba, a koopa, and a bob-omb, have pretty much exactly the same abilities in both games). despite the close similarities, it had been long enough since i’d played TTYD that i didn’t feel like it was too much of a chore to play through this game. 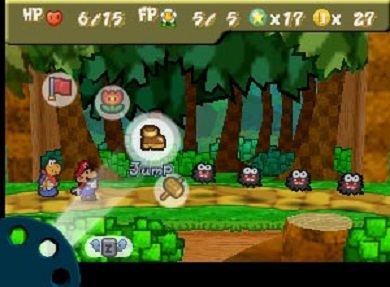 the pacing of all the paper mario games has been slow due to mario’s slow walking speed, although this game includes a dash ability that makes getting around a bit faster. the game is as wordy as the subsequent two games in the series, which could potentially get annoying, but for the most part you can skip conversations with NPCs and not worry about missing anything and so the optional dialogue serves as a nice way of making the world feel more alive without necessarily slowing things down too much. the game’s pace is steady and for most RPG fans a good length, and the battle mechanics are generally entertaining, although as repetitive as most RPGs. the badge mechanic is a great substitute for the traditional stat-boosting equipment found in other RPGs, and is satisfying without being overly simple. despite being very similar to TTYD, i would give this game the edge overall. i found the original to be more enjoyable not just because it was a solid first entry in what has become a regular series but also because the situations and locales feel more epic and unique. (TTYD makes much better use of the paper conceit, though, with mario gaining paper-specific powers, such as turning into a paper airplane.) anyway, i was motivated to finish this game so that i could continue on with the M&L series and get into the 3DS paper mario entry. i’ve actually already dipped into sticker star and am up to the second world, and i’m really enjoying the new mechanics and the different pace. i’ll prob. be posting more on that before too long. 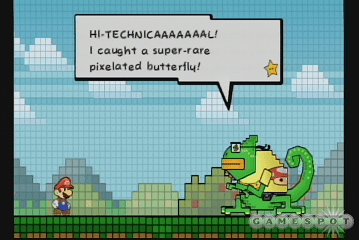 – i haven’t gotten into video game papercraft, but paper mario seems obviously suited for it. here are two (1, 2) paper mario related automata that look like they’d be fun to make. i finally finished playing through super mario RPG recently so i finally felt i could tackle some of the other mario RPGs at long last. i’ve had a copy of super paper mario ever since i’d first gotten my wii but had only played through the first chapter. i’d already played its immediate predecessor, the thousand-year door, and at that time i’d been intrigued by super paper mario‘s increased emphasis on platforming, so even though i wasn’t all that into the thousand-year door i decided to find out how the two games compared. i think my tolerance for slow games has steadily decreased. i still find it extremely hard to understand how SPM got such rapturous reviews because there was very, very little i found i could like about it. although there is an increase in the platforming elements, the game really doesn’t work as a platformer. the characters’ movements are all slow and the challenges are minimal, especially since you can pretty much always just flip into 3D and completely avoid enemies. speaking of which, the flipping mechanic, in which you go from 2D to 3D and back, gets boring fast. the hold-overs from the RPG days, such as hit points and items, also serve to make the game mind-numbingly easy, and the reams and reams of text, while admirably translated by NOA, get to be incredibly tedious. the three characters that accompany mario are only occasionally useful (and since only mario can flip you’ll end up using him the vast majority of the time anyway), and his completely personality-less pixl companions similarly only provide added skills in the most obvious and basic ways. the art style is stylized and well done in general, but they also get to feel very same-y, with the main exception of the whole last section which is completely and utterly drab and lifeless. having to wander around the town hub after every chapter is annoying, especially since instead of platforming challenges the game’s main levels are full of endless mazes you’ll have to slog through with way too much backtracking. the town itself is rife with one of my biggest pet peeves in RPGs, namely completely useless NPCs who have a seemingly endless supply of gab but serve absolutely no purpose other than to provide a smidge of increased atmosphere. the sidequests, particularly cooking, are even more painfully pointless than the average, and the motion controls are just an added chore. on top of all this, even within the main quest there are way too many sections that are just flat out obnoxious, like having to jump and hit the same block 100 times. ugh! i really had to force myself to finish this, and in the end this was one of the few games that i was eager to sell, even if it meant having a gap in my mario collection. i find myself hard-pressed to think of anything i really loved about this game. the only thing that comes to mind is francis, the otaku chameleon, and the usual small pleasure that comes from getting to play as other characters of the mario universe even in a dull game. disappointing, but i’m still hoping that paper mario and the mario and luigi games will prove that there are mario RPGs that i can actually like. i’d mentioned earlier this year that i had been stuck on pokemon gold for ages because all the copies of the game i had had dead batteries. similarly, i was prevented from playing the original mario RPG, super mario RPG: legend of the seven stars for the SNES until i finally took matters into my own hands and replaced the battery myself. 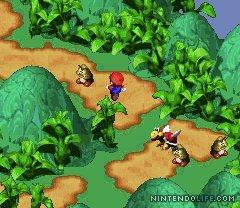 i’d played the paper mario game for gamecube, so playing mario RPG was a definite step back. 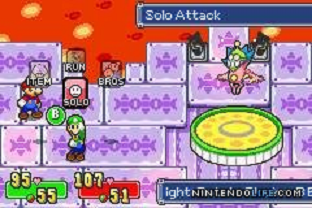 the game originated the subsequent spin-off series’ action commands during battle, but despite getting to play as certain members of the mario universe for the first time (although there is one painful omission), the rest of the game played out with very few surprises. as i’ve found with the other mario RPGs, it always feels a bit weird and unnatural to have characters other than the familiar ones we know and love from the classic platformers, although for this game square did a pretty good job of coming up with a host of new enemies and side characters that integrate well enough. i’m not a fan of mini-games and sidequests, but the game made them tolerable by keeping them in the background for the most part. and the general level of easiness of the game (with the exception of the beginning, which is actually a bit harder than you’d expect) ensures that level grinding is never an issue. as with other RPGs although you do get 5 characters to play with, there’s really never any motivation to use the two you don’t want to, although it is nice that the characters you don’t use level up the same as if they had participated in battle. the biggest drawback for me was the annoyance of having platformer-type stages thrown in every once in a while. while i thoroughly enjoy platformers in general, the isometric view more often than not makes it frustratingly difficult to tell where ledges, etc. actually are supposed to be or how far you should jump, and there’s way too much “try and die” gameplay involved. ugh. not much more to say. i’ve already checked out some of the other mario RPGs, and although i’m finding them on the whole to be only marginally more interesting than the average RPG, they do tend to be packed with charm and that special brand of nintendo whimsy. i’m really looking forward to seeing my main man ‘uigi team up with his older bro and delving more into the paper mario series as well, so perhaps i’ll be pleasantly surprised. – themushroomkingdom.net has a good section on the game, including details on the nintendo cameos and a comparison of the japanese version. – speaking of the nintendo cameos, here’s a link to a video of the link cameo and the samus cameo. i actually finished paper mario: the 1000-year old door before i finished luigi’s mansion, but i had rushed through the ending and hadn’t really done any of the sidequests (i.e. the trouble center). so i went back and did quite a few of them (inc. getting the extra character that i hadn’t known about — which i highly recommend doing sooner than later b/c it leads you to finding a lot more star pieces). but then it was just too much of the same so i didn’t bother being a completist. another deterrent to playing more was that after you beat the game enemies only ever give you 1 exp. pt if you beat them, so it takes ages to get upgrades. if i had known that i would’ve held off finishing the game; as it was the ending took me a few tries b/c i didn’t take the time to go through as many battles as i should’ve. all in all the game was just so-so for me. the battle sequences were def. lively, and in general the game made fairly good use of the standard RPG elements, but as others have noted the game gets bogged down in a lot of text. i didn’t think the scenes w/ peach added much (although i def. 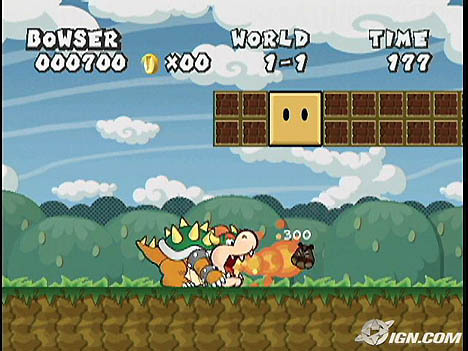 enjoyed getting to play as bowser, minimal as that was), and in general the characterization was too “flat” (haha). but seriously, yes it’s mario which does not usually require a story, but it’s an RPG and there were only a few characters i felt any interest in at all, and in general the pace of the game was just too slow. there were some clever non-RPG moments near the end that made me look forward to the platformer super paper mario that’s supposedly in the works, much more than i look forward to another mario RPG. even so, i’m sort of interested in what the other mario RPG’s are like. prob. won’t hit the orig. 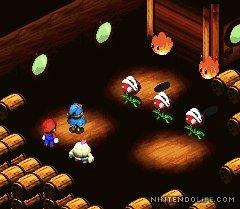 paper mario any time soon, but the mario and luigi game on the GBA (superstar saga) was developed by a diff. company and might be worth looking into. also, the orig. mario RPG (seven stars, on the SNES, developed by square who of course does the final fantasy series) might be worth tracking down as well, although apparently it’s fairly rare — although coming up soon on the virtual console so i hear, so i might just get it there … whenever i get around to getting a wii! not sure yet if i’ll ever pick this game up any time soon. i came across an entertaining blog entry that chronicles one person’s account of the pit of 100 trials that piques my interest in doing it myself, but not having many 3 1/2 chunks of time to spare i’m prob. going to hold off on that … until i retire at least haha. as usual ign.com is a good place to look for a guide (although this one has one noticeable gap in particular, namely character bios). … hmm … what should i play next … ?